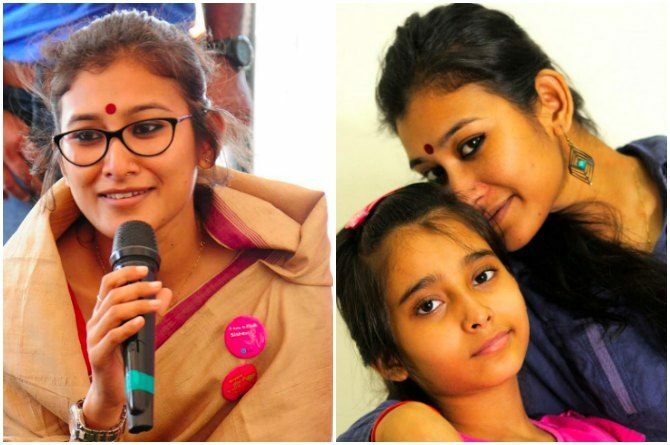 "I Had No Idea How To Lead A Single Life With A Two-And-A-Half-Year-Old baby after my divorce"
"I had no idea how to lead a single life with a two-and-half-year old baby after my divorce"
A cancer survivor, single mother and a born fighter, Monali Bhardhwaj's story is the best thing you will read today! While we keep looking for superheroes in celebs and stars, the fact is there are many such strong fighters all around us whose life is worth imitating. Assistant director Monali Bhardwaj is one of those strong women and mother, who can be that "real-life hero" for all of us mothers. Divorced at a young age, Monali reared her daughter all my herself as a confident, single mother who had only one motto in life... when the going gets tough, the tough get going! She then had a live-in relationship, but the man ditched her as she was a divorcee and married someone else. A little after that she was diagnosed with Breast Cancer, but also happened to find a man she was ready to settle down with. Hailing from the small tea estate of Assam, Monali had a simple childhood like many other small town children. “My childhood was fun; I grew up with my paternal grandparents in a tea estate in Assam. My dad was in the police force and mum was housewife. My dad was my hero and mum is still a pillar of strength. I think that I have spent my most beautiful days our village with all my uncles, aunts, grandparents and friends. ‘Childhood was amazing’ if I could sum that in one line," says Monali. Like many small town girls, Monali got married at an early age. "I got married at the age of 21; by 24 I had Ruhi in my life. Life was beautiful till 2006, then everything started to fall apart. Compatibility issues raised in our relationship, So we decided to get separated. I had no idea about divorce, and money. I decided to come to Delhi and joined one of my friend’s office. Till my divorce I was a HOUSEWIFE, I had no idea how to lead a single life with a 2 and half year old baby," she says. However, Monali thought it would be a better idea to move to Mumbai so she moved to the city of dreams with a meagre 3000 rupees in her pocket. "With Rs 3000 in my hand I came to Bombay with a suitcase of clothes and Ruhi, she was almost three years by then. Next thing was to find a job. I was always fascinated by TV and through a friend I managed to connect with a production house. I met a top director and without experience I still looked and hoped for a job. After 15 days the accounts department told me that my job was satisfactory and they would pay me 8000 per month," she adds. Monali had landed a job, but the most thing still had to be done. Who would take care of here daughter when she is at work? She hadn't figured it out yet and she was scared! "I was happy and at the same time I was worried. Questions like who would take care of her, who would feed her, because my job as an assistant director demanded minimum 12-15 hours every day. The real battle began as I knew I could not afford one full-time maid to take care of daughter. So I agreed to do all the household chores like cooking, washing, cleaning for my flatmates and in return their house help would have to take care of Ruhi when I am at work," says Monali. Fortunately everyone agreed and Monali would start her day at 5:30 every morning, finish all the chores and head to work. The house help would stay with Ruhi but in evening she would feed her, put her to sleep and leave her like that. Her ex-husband was also not willing to help. "It was heart wrenching to see my daughter sleeping alone in mattress on the floor. I had to be tough, there was no options left for me. I decided not give up, not to beg, not to look back…. I literally kept a stone in my heart and moved on. I used to work 15-16 hrs a day, to save 10 Rs. I used to walk 10 kms a day, so that at the end of month I could save at least 3000 Rs. My daughter’s body was full of infections, hair was full of lice, but I ignored everything," says Monali. But Monali was undeterred. Her only goal was to give a better life to her daughter, even if it came with a heavy price of skipping meals and walking for miles to save 10 bucks. "I used to buy rice for 10 rupees, cook it in a pressure cooker, keep it in the fridge, next day morning again I would use that refrigerated rice, coz it becomes more in quantity and we could eat “Pet bharke”," she writes. Her hard work payed off..
Monali's hard work finally reaped her great dividends and she moved into a studio apartment. She also got a housemaid from Assam to help her. Ruhi started going to a good preschool. "My worked continued, my salary increased and life was little better and most importantly I was no more a shy woman. Bombay is and will be my teacher. This city has given me everything. It transformed me to an independent woman. I owe a lot to this place and I can say that my heart belongs here," she says happily today. Continue reading on the next page to know about Monali's battle with cancer and how she survived! Living in with a man..
Monali met another man in 2010 and they decided to live-in together. However, he left her to get married to someone else. "By this time I had lost my job and everything that I had done professionally. I was back to zero, again I hunted for a job, I got one luckily. Now my daughter was 9 yrs old and mature enough to understand me. I again started to slog. This time life was tougher, Ruhi was in an International school, house was bigger, had two dogs to take care of and there was no maid," she says. We used to communicate via sticky notes. She would get up in the morning, get ready for school, bite one biscuit and walk to school. When she left I was always asleep and when I came back from office, she would be asleep. -This is how we spent 6-8 months. It was august end 2014. On August 2014, one day while getting ready to office Monali noticed a lump near her underarm. But she ignored it for days even though she was running a fever almost every day. "After 15-20 days, by the time it was September, I was speaking to a friend of mine, I told her about the lump, and she told me to go to a doctor immediately. I rushed to see a doctor and the positive result came after lots of tests and biopsy by end of September," says Monali. Monali started on with her cancer treatment that included painful chemotherapy sessions. "My appetite was gone for ever, I became thin again. but I didn’t lose hope. I followed whatever my doctor had asked me to do. In the middle of the chemo’s I met my husband Abhijit Das," says Monali. After 15 days of knowing each other, Abhijit and Monali decided to get married and finally tied the knot in 2015.. While life is happy for Monali now, she's upset that she lost all her daughter's childhood years. "I have no memories with my daughter. I have been an unlucky mum. I could not see my child growing up, and she is already grown up. She is 12 yrs and studies in 6th standard," she says. Monali is now a cancer survivor and also a member of Pinkathon. Just this year she ran 3 km in 14 minutes. She wants mothers to take strength from their kids. She says that women are like magicians and can do anything they can, especially for their kids. "My advice to other mums would be – our kids are the biggest strength, we women are magicians, we create magic every day, if you go through cancer or any turmoil in life just talk to the family members, kids understand everything about their mums. They became so mature when their mums go through the rough patches of life," she sums up. Indeed Monali's life is a lesson for every mother and one that is full of heroic incidents that can help others who go through the same at some point of their lives. We salute her spirit and hope she continues to inspire other mothers forever! Also Read: Abused and tortured for twenty years, this mum is now a string fighter!